What does “extension” mean in this context? What is the difference between active and passive motion? What is particularly important when providing aftercare through splinting? Is it possible to remove the splint? Is it possible to make a fist while wearing a Kleinert splint? How does one perform exercises when wearing a Kleinert splint? What needs to be observed after approximately six weeks? 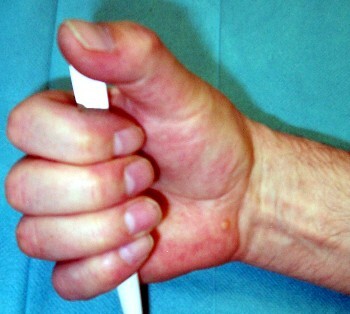 Flexion in this context refers to the motion of flexing the fingers (e.g. to make a fist). In isolated cases we may differentiate between the flexion of distal interphalangeal, proximal interphalangeal or metacarpophalangeal joints. If the healing process takes a regular course, occasional stretching of the fingers achieved by letting the hand dangle down for a short period of time is not going to be harmful. The specific aforementioned stretching motion is referred to as extension. Active motion is achieved by self-guided muscle power. If, for example, you make a fist, the contraction of the muscles of the forearm is transmitted onto the flexor tendons and causes the fingers to bend. The passive motion does not include any movement of the forearm muscles. It may be performed on you by a physiotherapist for example or you may even do so with the help of your other hand. It is also very important to understand that an aftercare program according to Kleinert, which uses rubber-band traction to flex the fingers, causes a passive flexion motion (meaning the flexor muscles of the forearm remain at rest and do not contract). As for any other splinting method (for example a cast) it is important not to apply the splint too tight and to avoid any pressure points. Should you experience a sensation of tightness or pressure-induced pain in any position of the splint, you should immediately seek medical advice. Please note, that a too tight splint or a too tight dressing may cause severe malfunctions within the hand or the forearm. Many injured patients reported that when raising their hand up to their heart or higher, the pain and/or swelling sensation diminished. Even when going for a walk it may be very advisable – particularly during the first weeks after the injury and the surgical procedure – to hold the injured hand in that position/height. If the healing process follows a regular course it is however not going to be harmful to let the hand dangle down for a short period of time. Please feel encouraged to move the elbow and especially the shoulder rather frequently! Normally it is not possible. It is difficult to reapply a Kleinert splint without professional help. Therefore please do only remove the splint when instructed to do so by your treating physician. Should you be forced to remove the splint (maybe because it got wet or dirty) please do so very carefully. You should, however, see your doctor immediately to have the splint reapplied in a professional manner. It is of utmost importance that while being without splint you do avoid any active movement of the fingers. You should under no circumstances try to make a fist on your own (actively)! Once again: Active in this context refers to the self-guided contraction of the forearm muscles. 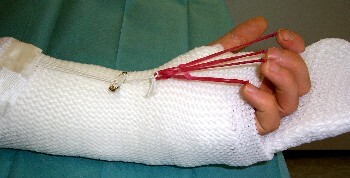 A fist closure may be achieved through the rubber band traction created by the Kleinert splint. You may actively flex the rubber band when your aftercare is being provided through a Kleinert splint. Start-out by carefully stretching out the fingers against the traction of the Kleinert splint. Make sure that the distal interphalangeal joint and the proximal interphalangeal joint are completely stretched out. (Most splinting therapies will immobilize the wrist and the metacarpophalangeal joint. It is however important, that the proximal interphalangeal as well as the distal interphalangeal joint are properly stretched-out. Otherwise there is a risk of retaining the joints in an uncomplete stretching position later on). It is also very important never to conduct any exercises that cause pain. Should you experience pain in the proximal interphalangeal or the distal interphalangeal joint while exercising, please do not continue to stretch while ignoring the pain! You should rather consult your treating physician or physiotherapist to find out up to which pain level you should be proceeding with your exercises. Also, never conduct a passive stretching motion of the proximal or distal interphalangeal joint on your own unless you received permission from your therapist. When you stretch out your fingers as described above, you will relax the entire forearm muscular system (both, flexor and extensor). In this case the rubber band traction will perform the stretching motion of the fingers. For better understanding: When following these directions while carrying out aftercare exercises, the flexor tendon very snugly runs through narrow tunnels without jeopardizing the suture marks through an unwanted muscular pulling motion. This will guarantee a smooth gliding motion while at the same time avoiding any adhesion and – if the healing process follows a regular course – secures an undisturbed recovery of the tendon suture mark. Most of the splinting therapies end after approximately six weeks. A regular everyday motion should then be possible for most of the flexor tendons. Please do consult your treating physician to find out how much strain you are permitted to put on the freshly healing tendons. Typically approximately six weeks after termination of the therapy a first approach to active motion is permitted while after approximately twelve weeks an increased straining will be allowed. Therefore it is safe to say that it is not recommendable to use the convalescing hand to pick up a heavy object like a suitcase after six to twelve weeks. The aforementioned information should only be used as general guidelines to aftercare procedures. The individual therapy plan can only be stipulated by the treating physician and physiotherapist who will evaluate the patient´s individual characteristics associated with the injury and surgical procedure.